That's what Joseph's big brothers thought. They were sure their father liked Joseph best. In some ways they were right. Joseph was the baby of the family. And new babies aren't much good at hunting, or watching sheep. Mostly they just roll around and cry a lot, and you have to do everything for them. So, when baby Joseph came along, of course Jacob spent a lot of time with him. Well, that, and babies are just so cute! But, Joseph's brothers didn't like it. And they didn't like Joseph. They were jealous. They wanted Dad to spend time with THEM. And so as Joseph got older, they picked on him. It was easy to do because they were bigger and stronger. When Dad wasn't looking, they bossed little Joseph around. They put beetles in his bed. They were always making him do stuff for them - like he was their slave or something. Well, one day they were all going to be in for a BIG surprise! Of course, being mean to someone their father loved probably wasn't the best idea. Did they think hurting Joseph would make their father love them more? That wasn't too smart. When Joseph was old enough, he went to work out in the fields with his brothers, watching over the sheep. Joseph was 17 now, and his brothers still didn't like him much. It probably didn't help things that when Joseph went home at night, he told his father when his brothers were goofing around instead of working. It really didn't help things much when one day, Jacob gave his son Joseph a new coat. It was a wondrous coat! It had long sleeves and was made of many colors. Joseph was so proud! He wore his new coat everywhere he went. Now Joseph's brothers were SURE their father liked Joseph best. And maybe he did. But Jacob loved each of his sons, and would have given his life for any one of them. Then one night, Joseph had a dream. The next morning, they were all sitting down for breakfast (you can be sure it wasn't Cheerios or Cap'n Crunch! - more like goat's milk and cheese. Yum!). And Joseph said, "You should have seen this dream I had! I dreamed that we were all out in the field, bundling our wheat together into sheaves. All of a sudden, my sheaf stood up all on its own - and then all of your sheaves made a circle around mine and bowed down to it!" "Yeah, right!" said Reuben, as he reached over and finished Joseph's cup of goat's milk. "Make me, you dreamer! You think you are going to be the boss of us?!!" And all the other brothers laughed and poked at Joseph. That night Joseph had another dream. The next morning at breakfast he told his brothers his new dream. "Last night I dreamed the sun, the moon and eleven stars were bowing down to me!" 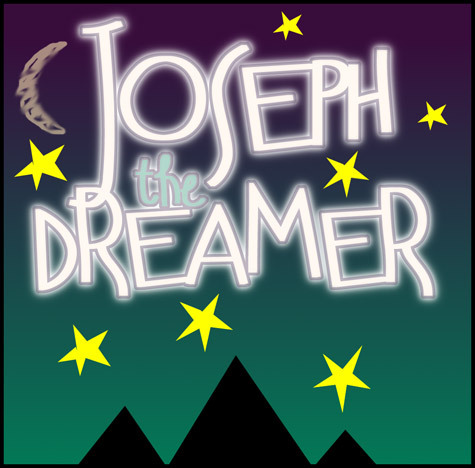 "Oh Great and Mighty Joseph!" his big brother Levi said, and bowed down to Joseph - and then he swiped his cheese. All his other brothers laughed and teased Joseph all the more. "Dreamer! Dreamer!" Poor Joseph didn't know what to do. He told his dream to his father, and even his father had enough of his nonsense, "You think your mother, your brothers and I are going to bow down and worship you?!"